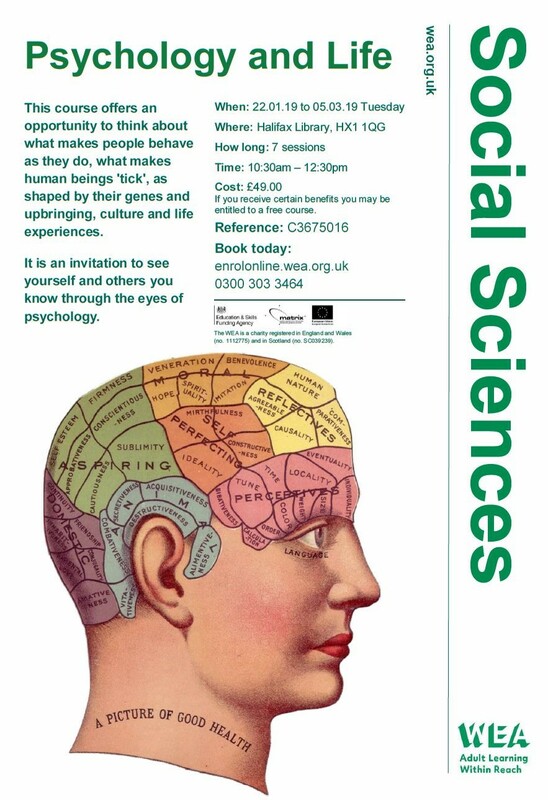 The WEA are offering a 7 week course starting Tuesday 22 January, 10:30am-12:30pm at Halifax Central Library HX1 1QG on ‘Psychology and Life’. There will also be a FREE taster session on Tuesday 15 January, 10:30am-12:pm. The course offers an opportunity to think about what makes people behave the way they do as shaped by genetics, upbringing, culture and life experiences. The cost for the course is £49 but if you are entitled to certain benefits the course may be FREE. Book online at enrolonline.wea.org.uk or call 0300 303 3464. This entry was posted in Feb, Health, Jan, Staying Well and tagged Central Library and Archives, WEA. Have your say on the 2019/20 Policing Budget!